I really enjoy writing these book reviews posts. They're fun to write and even more fun to discuss with you guys. To check out my past book reviews click the tag JS Book Review. 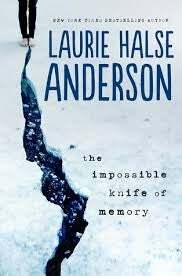 I read "The Impossible Knife of Memory" because Laurie Halse Anderson is visiting my city soon to promote it and it had a surprisingly short hold list at the library so I got it quickly. After five years of Hayley's dad, Andy, homeschooling her from the road as he worked as a truck driver, he decided, yet again, that it was time to settle down, this time in his old hometown. Hayley enters public high school and has a difficult time caring about grades or silly extracurriculars like the school newspaper when she has bigger things to deal with, like her dad's worsening PTSD and his old girlfriend Trish coming back to ruin their lives. Hayley starts a guarded relationship with Finn, a hottie from the swim team, who initially seems perfect for her, but she soon discovers that he has family problems too. The story is well written, especially the witty dialogue between Hayley and Finn, which often made me literally laugh out loud. Despite this, I found I was missing an emotional connection with the characters. Even with the heavy tones and sad topics I didn't cry once and I am a huge cryer. However, I will freely admit that I usually do not read books with such a serious subject matter, so maybe this just isn't my type of book. Recommendation: Wait for paperback or borrow it from the library. Anderson wrote the Hayley/Finn relationship well. I like that they both became selfish and didn't understand how to deal with the other's problems; it felt realistic to me. I didn't like the war flashbacks(? ), but I think that is more about me not being interested in reading about war. I did not like the ending; it made Andy's suicide attempt and him saving Hayley's life a turning point in his life, after which everything was fine. Personally, I would feel very guilty if my actions almost killed my daughter. I think those events should've just started another dark patch. Despite Hayley explicitly saying the ending wasn't happily ever after, I thought the ending was. Face it, in the end: Andy got better, Hayley asked Trish to move in with them, Hayley went to college, and Finn got a huge scholarship to his super expensive mock-Middlebury dream school. What did you think? What similar books do you recommend? How do you compare this book with other books by Laurie Halse Anderson?